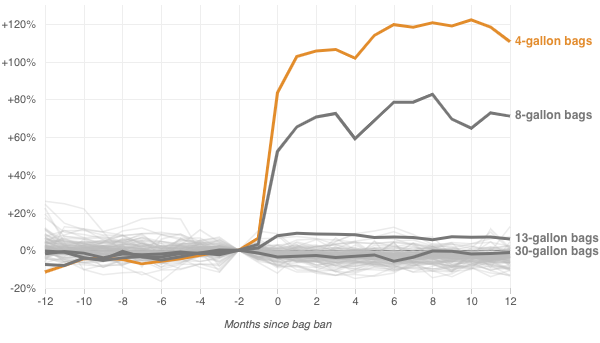 Source: Taylor, 2019, “Bag leakage: The effect of disposable carryout bag regulations on unregulated bags.” Researcher’s own analyses calculated based in part on data from The Nielsen Co. (US) LLC and marketing databases provided through the Nielsen Datasets at the Kilts Center for Marketing Data Center at The University of Chicago Booth School of Business. The conclusions drawn from the Nielsen data are those of the researcher and do not reflect the views of Nielsen. Nielsen is not responsible for, had no role in, and was not involved in analyzing and preparing the results reported herein.